I'm betraying the idea of this being a blog devoted solely to Sherlock Holmes pastiche and today bringing you a canonical entry. I do this because I love this Dell paperback from 1985 that tied-in with the Granada TV series starring the great Jeremy Brett (which aired in the U.S. on PBS). When I first saw this edition in my college bookstore, I had not yet seen the Granada series, and I remembering being a bit uncertain about this chap on the cover. Ha! "Come, Watson, come! The game is afoot!" 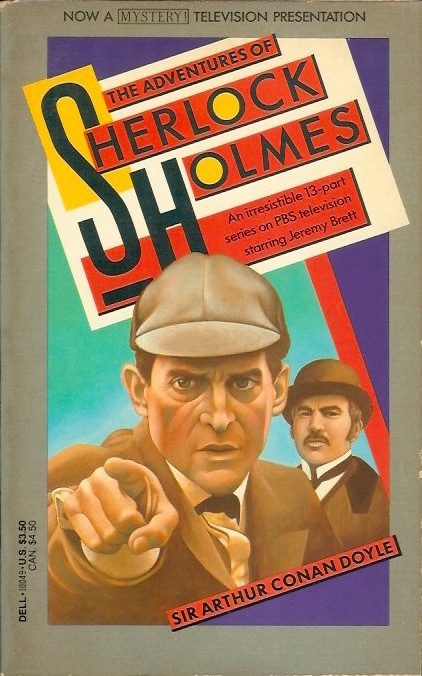 Here, in thirteen of his finest adventures––brought together for the first time in one paperback volume––Sherlock Holmes, the world's most famous detective, helps governesses in distress, clears young men wrongly accused of dire crimes, and catches criminals in cases hopelessly bungled by Inspector Lestrade of Scotland Yard. No sinister development can dissuade Holmes from pursuing each mystery to its brilliant conclusion––not even the malevolent cunning of Morality, his arch enemy, the Napoleon of Crime. Just as the Granada TV series carries us back, with stunning authenticity, into the fascinating Victorian era, these stories carry us into a world of mystery without parallel, setting a standard still unsurpassed in a century of detective fiction.